Published in 2013, this report celebrates the growing success of University museums as part of the UK higher education sector and their unique contribution to the public profile of universities across the UK. University Museums hold 30% of nationally-significant collections but constitute only 4% of England and Wales’ museums. In Scotland, three university museums alone hold 14% of nationally-significant collections. 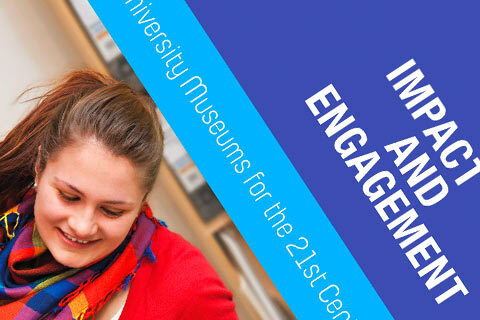 The report shows how University Museums deliver unique benefits to the HE and wider cultural sector and have demonstrated exceptional performance in leveraging funding, with the Higher Education Funding Council for England (HEFCE) core funding having enabled an increase of non-HE funding by 179 per cent to £20.34 million over the last five years. Resourcing from the Scottish Further and Higher Education Council (SFC) has recently increased its museums, galleries and collections grant to £6 million over five academic years and extended the number of universities receiving the grant from five to nine to include all higher education institutions which have nationally accredited collections. Read online by clicking on the image below or download the complete document here: Impact and Engagement (2MB pdf). You can also explore the document and case studies by following the links on this site. Each section is illustrated by a series of case studies drawn from across the broad spectrum of University Museums. You can also browse the complete set of case studies here: Case Studies.